Hardcover, 9 x 11.75 in. / 64 pgs / 60 color. Featured image, reproduced from Chaos, is "Shatter 2," (2009), by Tauba Auerbach, keynote speaker at this year's New York Art Book Fair. On Saturday, October 1, from 2:00-3:30pm, the artist will discuss artists' books as a central part of her practice, including her recent oversized pop-up book featuring six die-cut paper sculptures, published by Printed Matter, Inc. Please drop by our booth, B07, and our permanent store, ARTBOOK @ MoMA PS1 while visiting the fair! For more information about our booth, featuring all available issues of Pierpaolo Ferrari and Maurizio Cattelan's Toilet Paper, along with a collectible Toilet Paper tote bag designed by Cattelan, please continue to our blog. Text by Will Bradley, Brian Sholis, Chris Jennings. Chaos, a new book by artist Tauba Auerbach produced in conjunction with her exhibition Here Now/And Everywhere at New York's Deitch Projects, explores the shadowy gap between order and disorder, pattern and randomness. By linking mathematical philosophy and scientific theory with larger, existential human concerns, Auerbach produces an array of complex conceptual and visual experiments that manifest as a body of striking paintings and photographs, minimalist metaphors of information overload. Evoking the information abyss of visual static, Auerbach's Crease, Crumple, Shatter and Static series investigate the logic and machinery of communication and representation. As they do so, unintended or unexpected effects emerge in conjunction with instances of ambiguity, contradiction, paradox and breakdown. 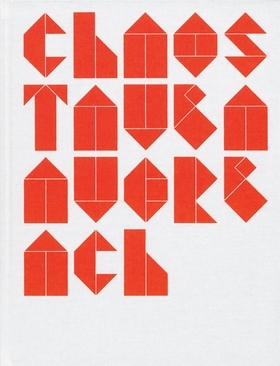 Fully illustrated and beautifully bound, Chaos also constitutes a mini-catalogue raisonné of Auerbach's artist's books and includes new critical essays by Will Bradley, Chris Jennings and Brian Sholis. 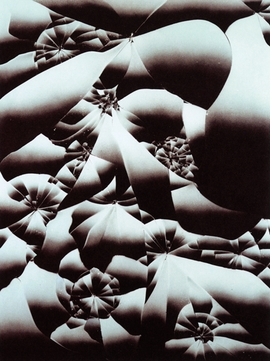 Featured image, reproduced from Chaos, is "Shatter 2," (2009), by Tauba Auerbach. FORMAT: Hbk, 9 x 11.75 in. / 64 pgs / 60 color.